After installing the Vacuum tube solar collectors on the roof and finding a good spot for the installation of solar water storage tank and pumping station, choosing a reliable and easy to install piping system should be a priority for both the installer and home owner. On the one hand, home owner wants a cost effective and a trouble free piping system for the lifetime of the installation, on the other hand installer wants a piping system that takes the least time to install, don’t generate maintenance call later on and allows the installer to finish the job quickly and move on to the next available job. Despite the fact that solar water heating kits are much cheaper than they were couple of years ago, they are still considered expensive and luxury appliances especially is Provinces where electricity or natural gas are cheap (as in Quebec or Manitoba) and / or annual Solar Insolation is very low (British Colombia and Newfoundland). In such places, Accounting Payback of a “Do it yourself” water heater (Installed by homeowner) is around 5-7 years, and 10 years and even more when installed by a professional contractor. So making a smart piping system choice, is crucial for the long term feasibility and pay ability of every solar water heating project. There are an infinite number of available piping system in market, the right piping system shall have physical and thermal properties in excess of Solar Water Heating peak operating conditions (such as temperature, pressure, etc.…). For the purpose of this article we will study the most common piping systems available for almost everyone in Canada: Copper Pipes and Fittings (Whether type K, L or M), Flexible Stainless Steel Pipes and Fittings and PEX Plastic Pipes and Fittings. 1-	Pressure and Temperature Rating. 2-	Joinability, Familiarity and ease of fabrication..
3-	Availability: at place like Lowes, Home Depot, Rona, etc.… or it has to be sourced from specialised stores. 4-	Anticipated useful lifetime of the installation. 5-	Suitability for outdoor application. Mostly populated cities in Canada are located in the southern part of the country and have less more flexible peak operating conditions than central and southern US Sates such as Florida, Arizona or even California. Maximum Operating pressure depends on the available closed loop piping length, friction loss, flow and height between Highest point (Usually Solar Collectors on the roof) and lowest point (Usually Solar water tank installed at the ground of basement floor). Maximum Operating Temperature usually happens in the summer when energy generated by the panels exceed hot water demand, which cause heat buildup and increases both temperature and pressure within the closed loop piping system. In some place, where solar insolation is at its peak and hot water consumption is at its low, temperature within a closed loop solar system as can reach values as high as 250°F. Maximum operating pressure cannot be over 80 PSI in most residential applications. 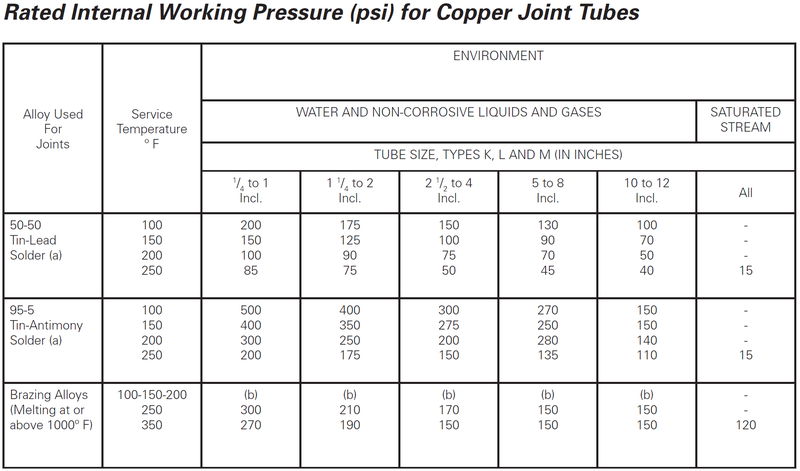 Pressure and Temperature Rating: Pressure and Temperature ratings of copper pipes & welded fittings (Type K, L, M) are much higher than 80 PSI and 250°F. We don’t recommend using compression fittings with rubber joints in solar application since it contains plastic that cannot sustain high temperatures. The weakest point in most piping application is the joint between two different pieces. For solar application, we do not recommend soldered joints since (as you can see from the above table), soldered joints have very low pressure ratings at higher temperatures. The safest type of joint for copper pipes and fitting is brazing alloys, where melting temperature is 1000°F and above. Joinability and Ease of Fabrication: Brazing is not a DIY activity and in most Canadian provinces requires the person carry such activity to be licensed welder. The time and effort required is significant especially with installations with a lot of fittings. It’s worth noting that small copper pipe sizes can be bought in coils of 25, 50, 100 ft. long. Also Bending Coiled Copper piping requires special tools (Pipe Bender like the ones used in refrigeration application. Coiled copper pipes are not easily maneuverable like flexible stainless steel pipes but remain a faster option for simple straight to the roof solar piping. Availability: Copper pipes are widely available in home improvement stores such as home depot, Lowes, Renot Depot, etc.… as well as many online supply stores in Canada and in the US. Anticipated Life time: Copper anticipated lifetime in closed loop application is 30 years and can be extended to 50 years if chemical properties of circulating fluid are properly maintained. Suitability for outdoor application: Copper pipes and fitting are suitable for indoor and outdoor application. For outdoor insulated applications, it’s highly recommended to protect thermal insulation with UV resistant and water proof Vapor Barrier. Resembles Corrugated Flexible Stainless Steel Pipe Used in Gas Lines, it has recently found its way into solar water heating application. Flexible high-grade stainless steel tube 316L (or 304). Maximum pressure up to 17.5 bar, Rated burst pressure 200 bar ,1050℃ high temperature annealing heat treatment, food grade. Seamless UV resistant Jacketing coated on the insulation pipe is with a super high density water proof polyolefin copolymer foil. have excellent performance of UV-resistance , of strong tenacity performance, water proof , Machinery destroy-Protective and bird peck-Protective.passed 500 hours UV test. Our pre-insualted flexible stainless steel Solar Hose with high temperature EPDM insulation pipe ,Strong Jacketing protection and 2-core temperature sensor cable pre-assembled , it is an ideal choice for your solar thermal system. It realizes the fast pipe connection among solar collectors, the pump station and the water tank. No-welding is required! The system is light weight and space saving, which is easy to handle, even in confined spaces. Flow and return pipes are marked clearly and can be easily distinguished. Smart Design- Break Point does good to installer separate twin pipes into 2 pipes without any destroy of the jacketing protection, meeting the installation demand very well. Pressure and Temperature Rating: 100% Genuine EPDM insulation pipe. Light, flexible, closed cell, synthetic rubber; free of PVC and non- CFC.Very good ozone resistance, UV-resistant. Work Temperature range from -200℃ to 150℃, Max to 175℃ (including Joints). Since Stainless Steel solar pipes are flexible, they are much easier to work with. All the installer has to do is to open the box, uncoil the piping and then start snacking it through the building. Unlike Copper Coils, changing directions with Stainless Pipes does not required any special tools (such as pipe Bender, etc...). For More information on how to manipulate Solar Flexible Stainless Steel pipes, refer to our technical Blog: Step by step solar hose installation. Unlike Copper Flexible Stainless Pipes & Fittings for solar applications are only available in specialized stores like our store. Stainless Flexible Pipes have an anticipated lifetime in closed loop application is 30 years. In terms of Chemical Resistance, they do perform better than Copper. Stainless Flexible Pipes and fitting are suitable for indoor and outdoor application. For outdoor insulated applications, it’s highly recommended to buy Factory thermally insulated Pipes with UV Resistant Jacketing and Water Proof Vapor Barrier. Friction Loss: This product has a great place in systems whose pump flow rates are small if you used the 3/4 inch sized stainless steel product. On the one hand, the 1/2 inch SS Pipe has about four to five time the head loss of smooth copper pipe of the same size. On the other hand SS Pipe has less short radius elbows. That's why we don't recommend using the 1/2 Inch pipe size for applications having more than one Vacuum Tube Collector. Bigger Diameter Pipes: SS Flexible pipes are available in sizes ranging from 1/2 inch to 1 1/4 inch. In commercial applications, where pipe sizes exceed 1 1/4 inch, Installers and Designers shall specify rigid pipes (Mainly Copper). This limits the use of Stainless Steel Pipes to only Branches between main pipes and Solar Collectors. Material Cost Considerations: Flexible Stainless Steel costs much more per foot than copper. That said the installation will be quicker than with copper pipes, which means you labour costs will be lower. You need to balance your labour cost associated with installation other types of accessories such as (Collector temperature Sensor Wire, Insulation, UV resistant Jacketing, etc...). In unionized working environment, having the job done by one contractor that buy and install Flexible Pre-Insulated Stainless Steel pipe with sensor cable is much cheaper than hiring three contractors: one for the piping, another one for the insulation and the last one for the wiring. Saving comes from Labor and management cost. Several Manufacturers offer a full line of high density polyethylene piping. This type of piping system has an oxygen blocking coating, which is needed to prevent oxygen from permeating through the pipe wall and causing corrosion. PEX is usually rated at 100 PSI @ 82°C (180°F) or 160 PSI @ 23°C (73°F). Another Variant of PEX pipes is the same one described above but with aluminum oxygen barrier inside the polyethylene. The aluminum layer improves Pipe's oxygen barrier properties as well as reduces pipes expansion at higher temperature. This type of pipe is mainly used is radiant floor heating systems. There several Ways to connect PEX pipes and fittings together. Crimping tool is most widely used method and consist of squeezing a clamp or a ring around the pipe onto barbed fitting of various types. Compression Fittings are also widely used. PEX Pipes can not be installed on the roof without UV protection. UV exposure due to sunlight degrades PEX Pipes and Fittings Thermal and Physical Properties. Since Pressurized Closed Loop Solar Piping operating conditions, we do not recommend using PEX pipes and Fittings for Solar Water Heating applications.